« VERY LARGE MANHATTAN BEACH NEWS COMING! Although the Gerritsen Beach Property Owners Association was kinda sorta promised a NYC Parks representative to explain what was going to happen to Mau-Mau/White Island, no one was able to attend due to a scheduling conflict. It’s not like the meeting dates change its always first Wednesday of every month. The Property Owners did get an explanation of what was going to happen behind the nature center. They are going to be adding steams, trails and boardwalks. I live in Gerritsen Beach and fish around MAU MAU Island all the time. This is a tragedy this island is home to ospey owls racoons opossoms rabbits muskrats turtles geese that is just to name a few.I have personally drited behind the Island and watched osprey swoop out of the sky grab a fish and perch on the island to eat it.Also to deny the public access around the island to fish jet ski water ski or even a boat ing is absurd . 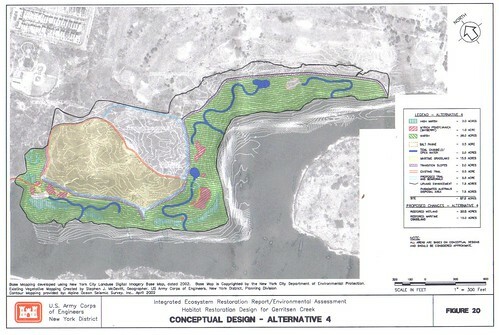 I also herd they wanted to dredge the area around the island . This will not only stir up old sediment polluting the water for people ( KIDDIE BEACH ) but many different fish and crabs live and breed around this Island destroying there habitat as well. The Island also use to be a garbage dump site now that it has vegatation on it and has settled all these years why would you unearth it in to the air. The way it is now by keeping the Island the way it is people use the shore line to hang out with the boats and jet skis never going into the thick vegatation so by the island looking so wild it protects all the wild life on it. I also would like to say none of the people on there water crafts are disrupting any habitat. In the summer it screams with life but even in the winter if your there its great also, this past March there was a seal there I saw it . WHO DO WE CONTACT TO STOP THIS I WOULD LIKE TO KNOW THE BULLDOZERS HAVE ALREADY STARTED PLEASE LET ME KNOW? Army Corp of Engineers? I’m not too sure, Net? You have to know which battles to fight, this ain’t one.